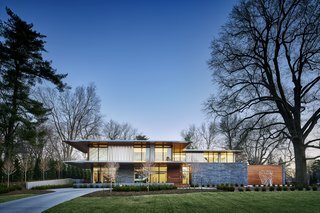 In this modern Midwest home, art and architecture blend as one to create a gallery-like residence for two prominent contemporary art collectors. 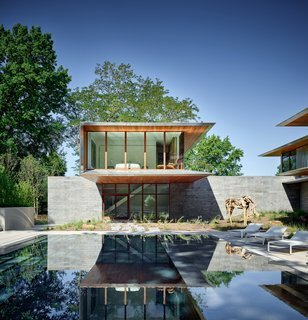 Filling 10,650 square feet of living spaces, art is intrinsically the heart of the home in this private dwelling designed by Missouri–based design studio and shop Hufft Projects. 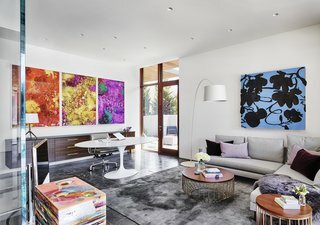 The traditional program of the house blends with gallery-like spaces, providing this family of renowned art collectors plenty of room to display their curated collection. The below-grade gallery space much resembles a modern art gallery. 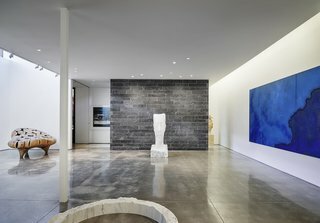 White walls and concrete floors provide the ideal backdrop for the curated collection of art, accented by indirect lighting. Porosity and transparency define the "arteries" that display artwork, connect the floors, and reveal moments of awe. 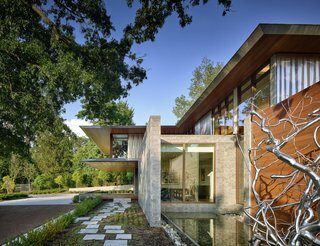 From the exterior, this three-level home appears as a large work of art. 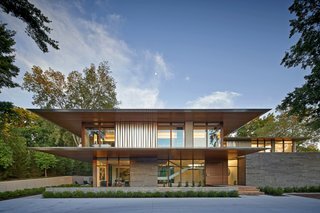 Dramatic cantilevered rooms, limestone-clad facades, expansive glazing, warm cedar, and striking aluminum accents encase an artery of living spaces. Dramatic in its horizontal expression, this private residence appears to extend into the landscape via deep overhangs and visual transparency. One of the two guest suites dramatically cantilevers out over the pool. The second guest suite, clad in cedar and aluminum, extends over a horizontal limestone wall. 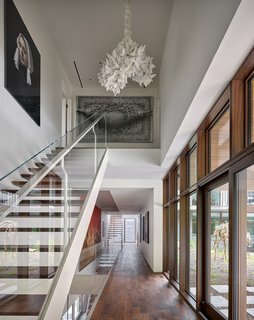 Named the "Artery Residence" for its art-focused diagram, the interiors are composed around three-story "arteries" which connect a below-grade gallery to the living spaces above, creating a continuous visual connection to the art from all points of the home. Through the holes cut in the floor plates, art extends between all floors, filling the home with a colorful display of artwork and sculptures. The circulation spaces are the "arteries" of the home, spreading color and artwork throughout the property. 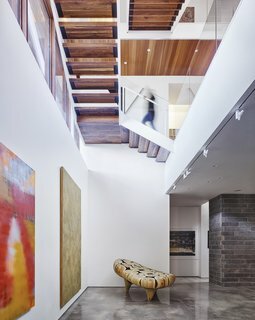 A open-tread staircase connects the below-grade gallery space to the living spaces above. Glass guardrails and the open treads allow for visual continuity and passage of light. The grand, open-tread wood staircase vertically connects the three floor plates, while creating an open and transparent connection between them all. 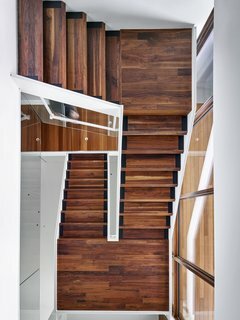 The long, wood stairs appear as a screen, quietly revealing artwork between levels and spaces. 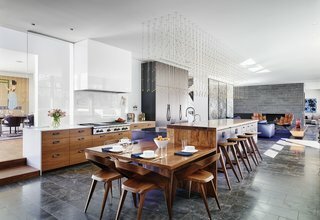 A modern kitchen, an elegant dining room, open living spaces, and his-and-her offices fill the limestone-clad volume on the main floor. 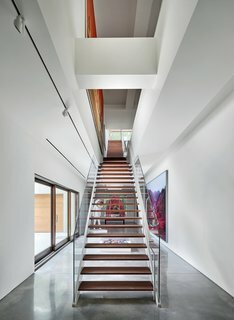 A long run of open-tread stairs acts as the vertical connector of the home. 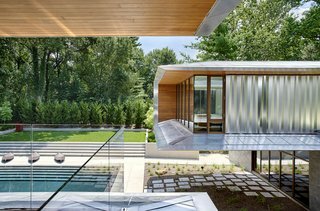 Above, three private bedrooms complete with en-suites, along with two guest suites, are contained in cedar and aluminum-clad volumes which extend out over the landscape. 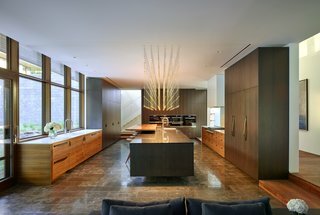 Subtle, subdued tones in the cabinetry, flooring, and walls provide the perfect backdrop for colorful works of art—or in the case of the kitchen, a custom chandelier. The custom island provides bar-top seating, as well as dining space. A more formal dining space is revealed beyond, complete with a similar chandelier. A sitting area, complete with a fireplace, is located at the center of the home. Large windows provide direct visual connection to the landscape. Each space, including his-and-her offices, becomes a unique backdrop for art. Large spaces and blank walls allow the owners to modify and rotate artwork locations over time, creating an endless palette of wonder. 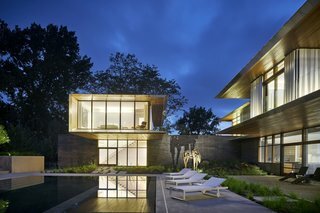 A Mahogany storefront system allows for grand views of the exterior landscape and sculpture garden. A recessed track allows curtains to be drawn in times of sleep or privacy. The master bath is a private retreat, complete with mosaic tiles, quartz countertops, and warm wood accents. The large soaking tub is an ideal location to enjoy the Midwestern views with the changing seasons. Even the exterior takes on the aura of a gallery. Large sculptural pieces are placed around the home, creating special moments of admiration and wonder along the terraces and onto the pool deck. Located on a large corner lot, a cast-in-place concrete entrance is cut into the hillside, providing a monumental at-grad access to the gallery. At night, the exterior sculptures take on a dramatic appearance. The home appears as a sculpture in itself, filled with colorful pieces to admire. 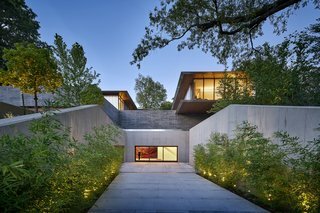 The transparent second-floor volumes appear like lanterns set atop the limestone plinths. Visual transparency between indoor and outdoor spaces transcends throughout the property. From the pool, private balconies on the second level are revealed as the aluminum maneuvers fold away. 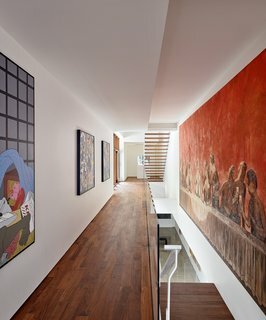 On-grade access allows the couple to transfer large pieces of art in and out, as well as open up the gallery to visitors while maintaining privacy to the residential spaces above. 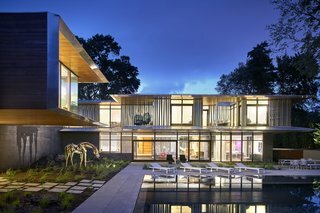 Not only is the home a visual work of art, but also an emblem of sustainable architectural strategies. 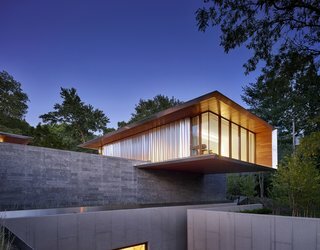 Natural daylighting and passive solar strategies are incorporated into the large overhangs that protect the interior from the harsh summer sun, while allowing the stone floors to soak up the winter rays. The large overhangs protect the interior spaces from direct sunlight, while also providing a layer of privacy. Geothermal, active solar, and LED lighting are all design components which minimize the environmental imprint of the home. Green roof terraces, permeable surfaces, and native vegetation create a lavish exterior, ideal as a sculptural backdrop yet also suitable for sustainable landscape growth. House and art gallery, this private residence is full of special moments of awe and admiration.